Remember when I talked about how my stand mixer was working double duty as a banana storage unit? Well those bananas were now past ripe, and it was time to do something with them. Banana bread is one of the few baked goods that I’ve made regularly in the past. This is very likely due to the fact that I like my bananas black, but then let them ripen past the point of structural integrity and have to find creative ways to use them up. This recipe uses some of the same ingredients I have used in banana breads of past – like vanilla for flavor and yogurt to keep things moist (I really wanted to use the word moist in at least one blog post!). As I was making this for my office as a Friday breakfast treat, and had some leftover cream cheese kicking around in the fridge, I thought I’d make a flavored cream cheese to go with the banana bread. I also added coconut as an add-in, but feel free to use anything else that tickles your fancy – chocolate chips always go over well! 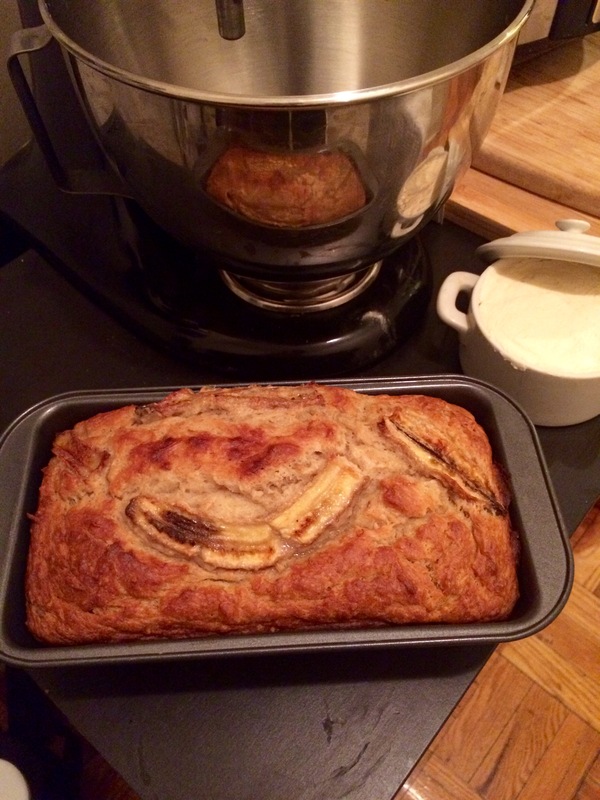 So was this the bestest banana bread I have ever made? Not quite, but it was a nice recipe to add to my repertoire. 1 cup plain yogurt – you can also use flavored yogurt here if you would like. Vanilla and coconut are good choices, but as flavored yogurts are already sweet, feel free to decrease the amount of sugar being added to 1/2 cup. Use the paddle attachment of your stand mixer to mash the bananas. This can also be done using a masher by hand. Add the butter, egg, vanilla, and sugar and mix well. Pour the batter into the prepared pan and bake for 50 minutes to 1 hour and 10 minutes, until the top is golden brown. The bread should spring back to the touch and a skewer inserted into the center should come out with a few moist crumbs. Don’t worry if it is a bit underbaked. It’s better that way! Put the pan on a wire rack and let cool completely before turning out the bread and slicing it. Put cream cheese in stand mixer with paddle attachment – it is important that the cream cheese is at room temperature or it will not whip properly. Add maple syrup and vanilla and whip on medium speed until cream cheese has broken down and liquids are starting to be incorporated. Increase speed to high and whip to add air and create creamy/moussey texture. The cream cheese can be stored in the fridge, covered in plastic wrap for up to 5 days. To note: It is also equally as delicious on hot cinnamon – raisin bread. 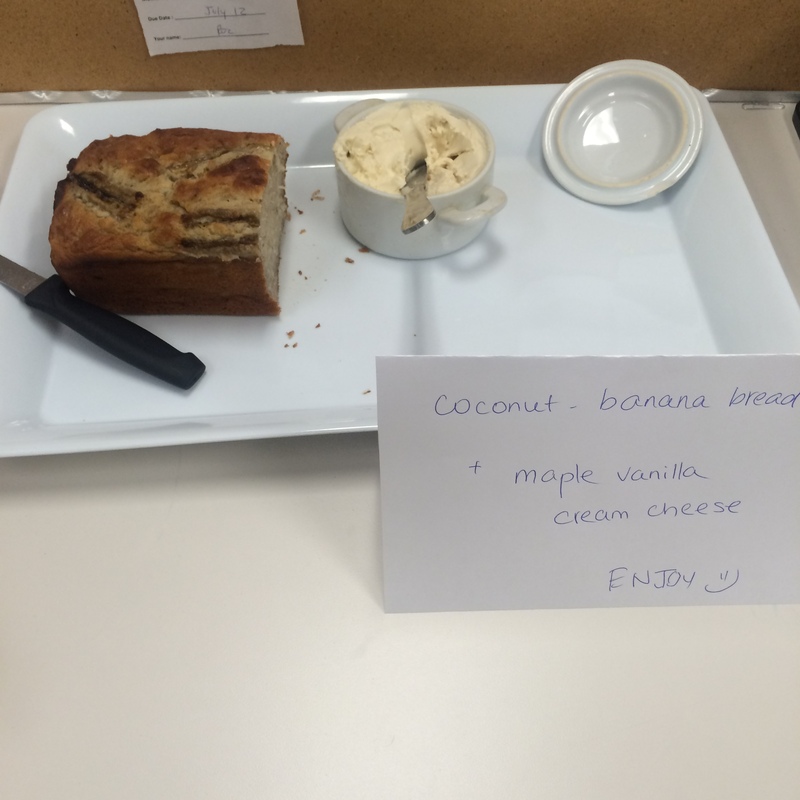 This is what happens to food in our offices – this took all of 5 minutes. 10 minutes later, it was all gone. I am making banana bread this weekend! this looks like a great recipe!